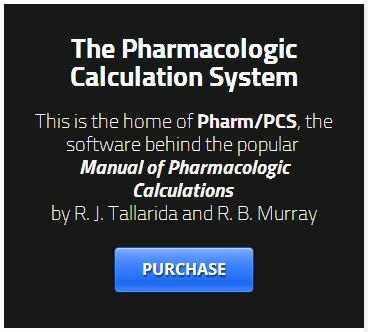 The Manual of Pharmacologic Calculations contains a collection of quantitative procedures in common use in pharmacology and related disciplines. It is intended for students and researchers in all fields who work with drugs. Many physicians, especially those concerned with clinical pharmacology, will also find much that is useful. The procedures included may be considered "core" since they are generally applicable to all classes of drugs. Some of the procedures deal with statistics and, hence, have even wider application. In this new edition we have increased the number of procedures from 33 (in the first edition) to 48. Other procedures have been revised and expanded. Yet the basic philosophy of this new edition remains unchanged from the first. That is, the pharmacologic basis of each procedure is presented, along with the necessary formulas and one or more worked examples. An associated computer program is available for each procedure and its use is illustrated with the same worked example used in the text.